Congratulations to Allen Bari, Winner of Event #4: $5,000 No-Limit Hold'em ($874,116)! Allen Bari - Event #4 Champion! Originally scheduled as a three-day event, Event #4: $5,000 No-Limit Hold’em at the 2011 World Series of Poker was stretched to four days. That doesn't mean a damn thing for Allen Bari though as he happily returned on the fourth day of play with a massive chip lead and rode it out to victory. Bari walked in the final day topping the final four with over 90 of the 130 big blinds in play. Although things started off somewhat rough for him, he was able to battle through the obstacles presented and walk away with nearly $875,000 in first-place prize money. 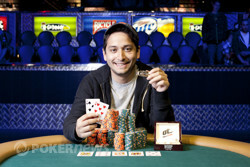 Not only that, Bari earned himself the most coveted prize in poker -- a WSOP gold bracelet! After Nicholas Blumenthal fell in fourth place, Sean LeFort went out in second. Maria Ho started the day as the shortest stack in the room, but was able to battle her way to heads-up play versus Bari, albeit at a massive chip disadvantage. When the two got down to heads-up play, Bari held 85.5% of the chips in play. Ho had some work to do, but never seemed to get anything going. Bari kept constant pressure on her and her short stack before the final blow came. On the final hand, Ho moved all in from the button and Bari called with pocket eights. Ho held and was looking for some help. The board failed to give her the improvement she needed to stave elimination and it was all over. Bari was instantly met with congratulations from his friends, which included Brent Hanks, Derek Raymond, Dan O'Brien, Chris Klodnicki and the late-running-in Jason Mercier. All of them embraced Bari with smiles, hugs and plenty of congratulations. Although Bari has talked in the past a bit about not playing much poker in the future, he did comment, "I was expecting one bracelet. Seriously, I thought that if I didn't win a bracelet it would be a joke." Well Allen, you got your bracelet and $874,116 in cash. Congratulations to Allen Bari and to all the players who cashed in this event. 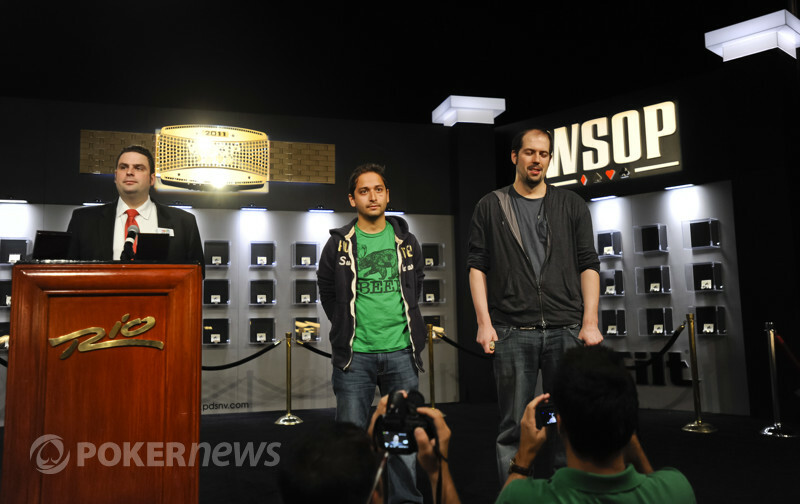 Don't forget to check out the rest of PokerNews live reporting from the 2011 WSOP. We'll be here live from the Rio around the clock every waking hour that a tournament is in action! Kristy speaks with him just moments after he wins. From the button, Maria Ho moved all in for a little over two million. Allen Bari snap-called from the big blind and tabled the . Ho held the for one overcard to Bari's pair. Both sets of cheering sections rose to their feet and began yelling for cards to help their player. Ho's fans yelled for an ace while Bari's for an eight. The flop came down with neither as the dealer ran out the first. The turn brought the and now Ho needed just an ace on the river to stay alive in this thing. The river completed the board with the and that was it. Bari leaped into his cheering section Lambeau Leap style as his friends held him up against the rail in celebration. Ho was congratulated with hugs from her own cheering section on the other side of the stage before Bari and her embraced with a big hug in the middle. 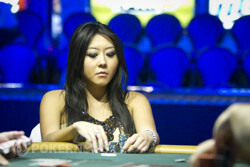 Ho took home $540,020 for her finish -- the largest score of her young poker career. Previously it was a $237,865 score from a 38th-place finish in the 2007 WSOP Main Event. From the button, MAria Ho limped in and Allen Bari checked in the big blind. The flop came down and Bari check-folded to a bet of 125,000 from Ho. Allen Bari min-raised the button to 240,000 and Maria Ho called from the big blind. The flop came down and both players checked to see the fall on the turn. Both checked again. The river was the and both players checked a third and final time. Ho showed the for a pair of sevens and Bari mucked. Maria Ho moved all in for about 1.7 million from the button and won the pot. Allen Bari raised to 240,000 from the button and Maria Ho called from the big blind to see the flop come down . Ho checked and Bari fired 175,000. Ho folded. From the button, Maria Ho limped in. Allen Bari checked in the big blind and off to a flop they went. The dealer placed the in the middle of the felt. Bari led for 125,000 and Ho called to see the fall on the turn. Bari bet 300,000 and Ho called. The fell on the river and Bari bet 425,000, having steadily increased his bets on each street. 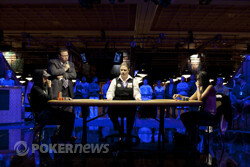 Ho thought for a little bit and then folded, allowing Bari to move to 10.925 million while she slipped to 2.05 million. EV04 champion Allen Bari shows off his bracelet.